Well, the road trips have started as we look for the right town and property to create our Big Yellow Guesthouse. This week, we’ll drive to Sierra City and Downieville, California to look at potential properties. We’ve recently seen Sierraville Hot Springs and really wish that it was for sale (and if we could afford it). It’s a beautiful property with a small hotel and several featured hot springs on the property. The place is slightly busy and could be more of a destination property with a little better marketing. 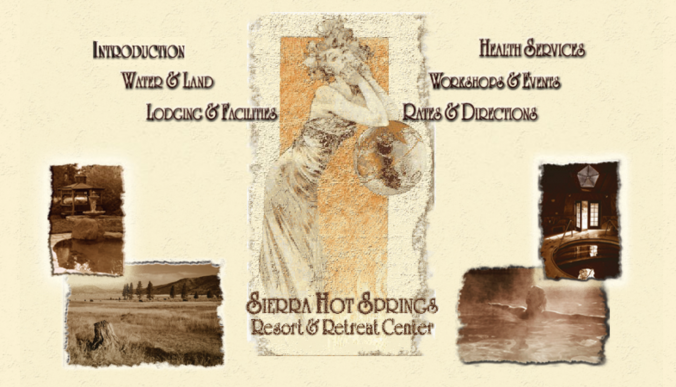 The buildings at Sierraville Hot Springs are fantastic and with a slight bit of exterior changes – could be iconic. Also, there are only 5 rooms and they all share bathrooms. Not exactly what we want to have. The big thing they have going for them is location, views, and hot springs! The hot pools are incredible and they have beautiful views from a deck that sits level with their main hot pool. This hot pool is not at the lodge, but is actually a short drive down their driveway and then a few hundred yard walk up a hill. Also, in the complete opposite direction on the property is a smaller hot pool to as a meditation pool. I really liked the meditation pool, but they keep the temp around 92-100 degrees. To me, that’s a little cool for winter. It would be much more enjoyable at 102 degrees. Also, there is no changing facility, just a cabana – so you’re leaving your clothes in the cabana or on the ground. Seems that they could improve this without too much effort. Maybe a 1/2 building with cubbies or something to hang stuff on. Anyway, I digress. I really would love to own this property but the size of it would certainly put it out of my price range. Seems that the property is at minimum, a 700 hundred acres. Beautiful. Amazing. And full of potential.